Don’t miss a single one of Michael Josephson’s thought-provoking commentaries, insightful observations or suggested resources for enriching your life! Subscribe to the blog feed to receive posts daily in your favorite RSS feed reader. 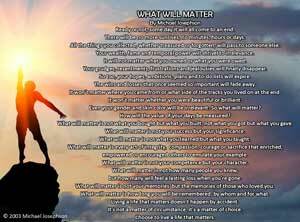 Like WhatWillMatter on Facebook to receive posts daily on your Facebook wall or Google+ page. View new posts at your convenience by bookmarking WhatWillMatter.com. Please help us build a dynamic community: Forward your favorite posts to your friends, or share via Twitter, Facebook or Google+. Regarding the “What Will Matter” poem… I do really like it. However, I noticed in “but how many will feel a lasting loss when your gone” should be you’re gone (you are) …not possessional ‘your’ …Just thought you would like to know. Oh my gosh – Thank you. We will fix it. You can use this link to subscribe to our weekly newsletter. Here’s our fb page too. Hi, love the articles. Tried subscribing but the link does not work. Please subscribe me to your newsletter. Many thanks. I had one of my dissertation students show me your poem. It is beautiful! I am writing a book and am wondering if I can get permission to use it? Love the articles on “The Greyhound Principle” as well as “The Nature and Importance of Integrity.” It will speak volume specially to business executives and serve as a reminder. May I ask permission to feature your articles the business page of our country’s newspaper and of course provide proper attribution to your authorship as well as the source? Would love to share your thoughts to our business community.